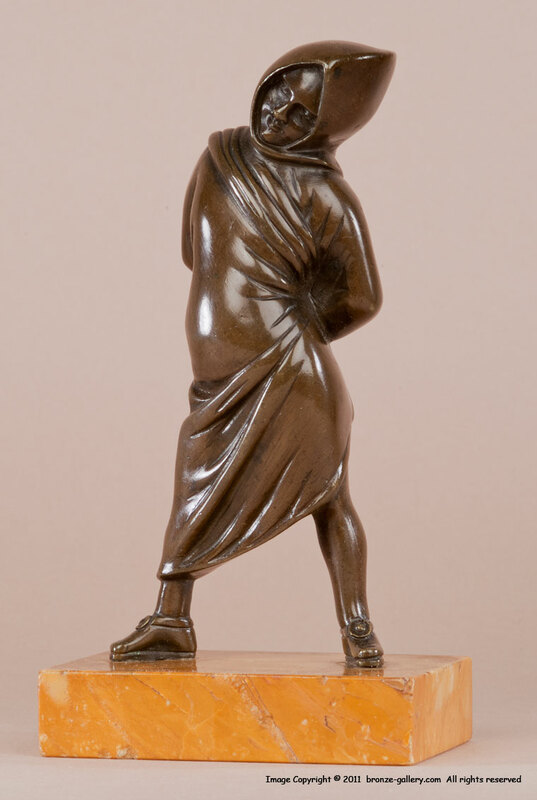 Barye's model of Le Petite Fou de Rome, or Roman Jester, is an interesting sculpture that was created about 1874 and cast in bronze a short time later. Both Ballu and Pivar in their books suggest that Barye cast this model directly from an authentic Tanagra figurine, which would explain the fact that none of these sculptures are signed. That also would coincide with the 1870s excavations in the Boeotian city of Tanagra when large numbers of these figures were discovered, and they would have caught Barye’s interest. These figures also appealed to Barye's friend the great Orientalist artist Jean-Leon Gerome. In his sculpture titled Tanagra, Gerome depicted a seated woman with Tanagra figures on her hand and strewn around her feet. One of the figures peering out of the ground is that of Le Petit Fou de Rome. 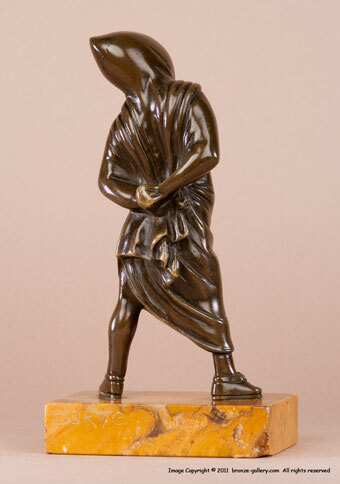 These small Fou de Rome bronzes were not cast in large numbers and do not come up for sale often. Some were cast by Barbedienne foundry but most of them have no foundry mark at all. Our bronze of Le Petite Fou de Rome is a good 19th century cast with a rich dark bronze patina. He is mounted on the original yellow sienna marble rectangular base which has Barye's name engraved on it. An unusual piece for a Barye collection.